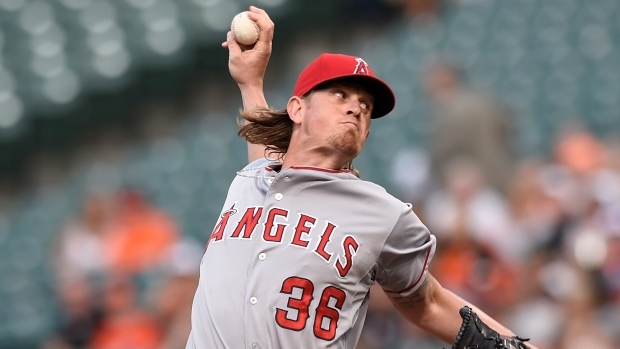 BALTIMORE - Jered Weaver allowed one run and three hits while pitching into the eighth inning, leading the Los Angeles Angels past the Baltimore Orioles 3-1 on Friday night. Albert Pujols hit his sixth home run for Los Angeles, which has won seven of its past nine, including a season-high four straight. Weaver let his defence do most of the work against the Orioles' lineup and struck out three with just one walk. Weaver (2-4) was coming off a shutout against the Astros and held the Orioles scoreless before J.J. Hardy led off the eighth with a homer. Huston Street pitched a scoreless ninth to pick up his 12th save. Wei-Yin Chen (1-2) had an effective outing for Baltimore overshadowed by Weaver. He allowed two runs on seven hits and tied a season high with seven strikeouts with a walk over seven innings. It was the fifth time this season that Chen allowed two runs or fewer and not earned a victory. Pujols gave the Angels a 1-0 lead in the first with a two-out homer to left on a 92-mph fastball by Chen. Los Angeles added another run an inning later when Erick Aybar led off with a double and scored on a sacrifice fly by Carlos Perez. Weaver retired 13 of the first 15 batters he faced before his error allowed Hardy to reach second in the fifth. Weaver got out of the inning by getting Rey Navarro on a popout and striking out Caleb Joseph. Hardy, who had two hits, pulled the Orioles to within a run and ended Weaver's night. Joe Smith got out of the eighth after allowing a single to Manny Machado, who has reached base for a career-high 20 straight games. The Angels added an insurance run in the ninth on a sacrifice fly by Johnny Giavotella. Angels: There were no injury updates. Orioles: C Matt Wieters (right elbow) will join the team next weekend in Miami before potentially beginning a rehab start. Wieters remains on schedule to come off the DL on June 4. Angels: Matt Shoemaker (2-3) is looking to bounce back after allowing a season-high six runs in three innings in a 6-5 loss to Houston on May 9. Orioles: Bud Norris (1-4) is scheduled to start, but has been dealing with an illness. If he is scratched, Ubaldo Jimenez will be moved up a day to replace him and Chris Tillman will pitch Sunday.